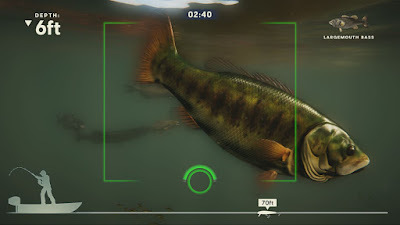 Fishing games are few and far between on Xbox One (and Euro Fishing is too weird and different, sorry) so I jumped at the chance to play Rapala Fishing: Pro Series. It’s kind of an odd duck, honestly. It is more like a rhythm game masquerading as a fishing game than any sort of fishing sim so it likely won’t be what most people are looking for. The simple arcade-style gameplay is still kind of fun and addictive, though, and I’d be lying if I said I haven’t had fun with it. Continue reading for all of the details in our full Rapala Fishing: Pro Series Xbox One review. 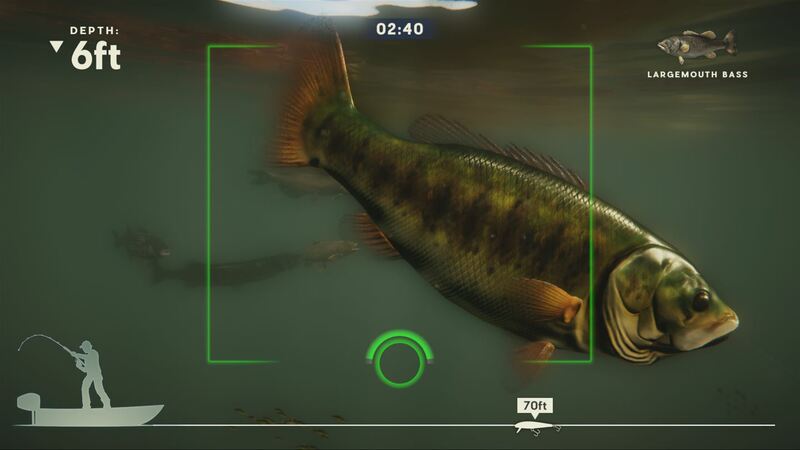 Rapala Fishing: Pro Series is an arcade-style fishing game that features 24 fish species, a handful of lakes, and a ton of different lures, reels, lines, and even boats to choose from. It is disappointing, though I suppose not surprising considering the license, that the only lures you have are Rapala plugs and crankbaits and the like and there aren’t any plastic worms or jigs or spinnerbaits in sight. I’m a bass fisherman in real life, so not having a spinnerbait is like going hunting with no bullets in your gun. I know other lures work, I just like what I like. It isn’t as if the fishing is particularly realistic anyway, so you can toss anything you know about real fishing out the window. For example, you drive your boat around to wherever on the lake you want, but you can’t then cast towards the bank or near structures. You can only fish in deeper water. What the heck, right? So you follow your fish finder until there are fish in front of you and cast out into the abyss. Depending on which bait you’re using you’ll be more or less likely to attract specific species of fish. Here’s where things get really weird, though. Once you make your cast the game goes to an underwater camera and basically becomes a rhythm game where you input directional commands to make your lure “ping” and attract fish. Over and over you just press left, right, left, right (or whatever, each lure has its own pattern) and reel in with the right trigger. You’re guaranteed to catch a fish on every cast unless you drop anchor in a black hole with no fish around. When a fish bites (and they absolutely 100% will) you then push up on the left analog stick to set the hook. The game then becomes a wrestling match where you have to keep the fish in a box in the center of the screen and then click the left stick in to get a reel boost. Do this over and over until the fish is in your hands. And then repeat the whole process over and over and over again. There is no actual fishing going on here. It’s just catching. You don’t need skill. You don’t need real life knowledge to know how each lure works. You don’t need to know different species habitats and where they should be. You just cast, play a rhythm game, and drag fish into your boat one after another. With all of that said, the game isn’t un-enjoyable. There is definitely something fun about catching tons and tons of fish, even if it isn’t really fishing. Bigger fish put up more of a fight, of course, and they’re a blast to struggle with and eventually get into the boat. The game gives you objectives in the form of specific species to catch for rewards and you can also enter tournaments to make more money. You have to buy all of your equipment – line and individual lures included – and it is actually kind of heartbreaking when a big fish breaks off some of your kit. As far as presentation goes, Rapala Fishing: Pro Series’ mobile roots definitely show. This isn’t a good looking game and the human character models in the utterly pointless character customization are some of the ugliest you’ll find on the current gen of consoles. Above the water the graphics are barren and low detail and flat out ugly. Under the water the visuals look a little better, though, and it is fun to watch the fish all swimming around (and even better when they’re hitting your lure). The sound is fine, mostly since there isn’t much to listen to when your lure is underwater 95% of the time. The music isn’t annoying, which is all you can really ask for. 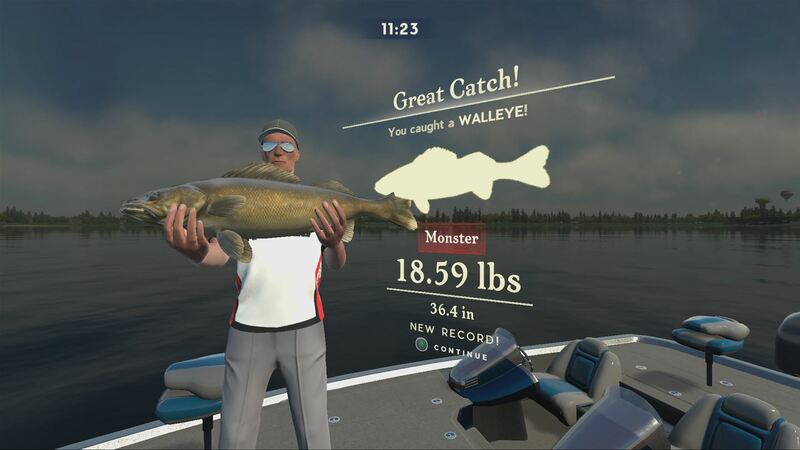 All in all, Rapala Fishing: Pro Series is an okay arcade-style fishing game. I can actually see myself coming back to it and catching some fish during the cold winter months. Obviously I would rather it were a more realistic fishing experience instead of a rhythm game in fish’s clothing (scales), but it’s still enjoyable in its own way. 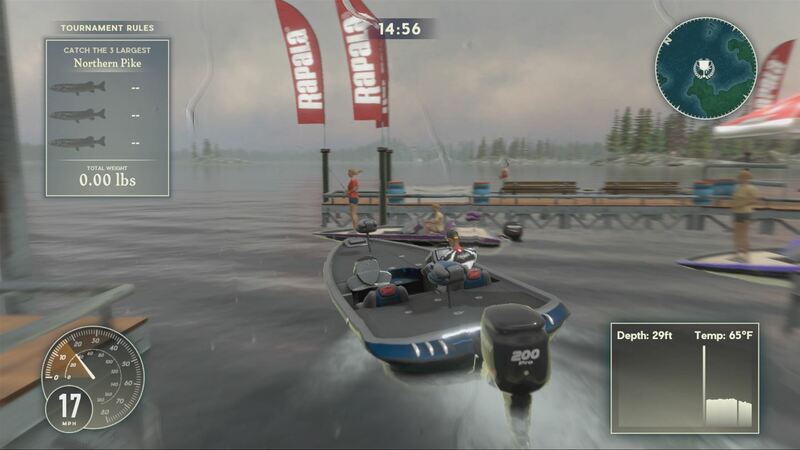 Desperate fishing fans on Xbox One may want to give Rapala Fishing: Pro Series a look.